Wonderful stay at Hanalei Moon Cottage We loved staying at the Hanalei Moon Beach Cottage. Eight years ago we stayed in the house next door. The place fit us perfectly and the view was amazing. So nice to be on the beach in less than one minute! Very clean and comfortable and quiet. We will be back next year for sure. Perfect Place For Two We usually vacation on the Big Island but decided to try something new. We spent 5 days at the Cottage January 16-21, 2012 and loved it and the area. Many friends recommended the Poipu area because the weather tends to be better but Hanalei Bay sounded more interesting and were very glad we made this decision. After a giant, exciting thunderstorm night one, we had mostly beautiful weather. The Cottage is comfortable, just the right configuration for two people. Only wish was that the house was closer to the ocean but we could still hear the waves at night from our bedroom. There is a big lawn between the house and the sand. The kitchen had most everything we needed--except for a coffee grinder and a working can opener. The area is great, just a quick walk or drive to the "downtown" Hanalei Town. Great places to eat, nearby Princeville Foodland supermarket, farmers markets. Too rough to swim on our beach or at Kee but we did snorkel at Anini Beach which is not too far away. The booking process was efficient. We would definitely stay here again. Heaven by the sea My husband and I have been fortunate to stay at Hanalei Moon Beach Cottage for the last six or seven years. What started out as a three day stay has now become three weeks. The cottage is cute, clean, and comfortable with two outdoor showers that we love. However, most importantly for us, is that its on beautiful Hanalei Bay. We plan on making Hanalei Moon Beach Cottage or home-away-from-home for many years to come. Relaxing, comfortable retreat e felt as if we were at home. The cottage had everything we could want. PLUS! A great view and the sound of waves. We relaxed to our hearts content. Walked the beach. barbecued fresh fish each night. The ultra vacation. Wed come back in a nanosecond! To put this review in perspecitve, this is our 7th trip to Kauai, 5th stay at the north shore, and 3rd time we spent a week in Hanalei. We were married at Princeville overlooking Hanalei 13 years ago, so, other words, this was not our first "rodeo" in Kaui or Hanalei.. Heres my simple review. This place is the PERFECT beach house for a couple. I cant imagine ever staying anywhere else in Hanalei. The house (cottage) is in great condition, the grounds are immaculate, and theres even an outdoor shower with hot water! The north end of the beach has no crowds, and its so quiet at night you can hear the foam crackle and pop after the waves break. The views of the bay and Princeville are spectacular, and I regularly found myself watching big wave surfers work the reef via the cottage telescope. When we had to jump online, the wireless and cell phone coverage was great. Mahalo to Suzanne, with major THANKS to her husband! Excellent trip! Beautiful house and location in Hanalei, in our eyes it cannot be beat! Very convenient, very efficient, so many things to do just outside your doorstep! The house suited us perfect, as it was just 2 of us - we went to the grocery store on the way in, and stayed there for a majority of our time - minus a few trips down the street to restaurants/bars, hiking The Napali, and visiting a few other beaches....the perfect setting with a gorgeous yard stretching to the sand....it just doesnt get any better!! Perfect! The house is better than what you see here. It is amazing to walk in to the living room and to be surrounded by the beauty that is Hanalei. Walk from the house to the water in a minute, turn around to look back at the house, and see the waterfalls. The bed is comfortable, the kitchen well stocked, a good selection of TV stations, close to town, the outdoor shower is perfect, it is an easy drive to all the east and north shore sites, and the list of outstanding features goes on. I wish I was there right now. The owners are super easy to work with. You should stay here. This is a magical location. I rented this property to celebrate my 50th birthday and was completely charmed. the VRBO description was accurate. The photos on the website represented the house very well. The property was clean on arrival and the owner/manager was very helpful. Excellent location and property. Loved It! Hanalei Moon Beach Cottage was perfect! 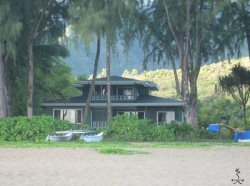 The location was great, right on the beach on the quiet end of Hanalei Bay, and within walking distance to Hanalei Town. We LOVED having an outdoor shower and a tankless water heater. The cottage was clean and quiet, and we loved being able to fall asleep to the sound of the ocean. In addition, Suzanne and Terri were great to work with. We miss the cottage and Hanalei already and cant wait to come back. The Perfect Place Beautiful location right on Hanalei Bay, with gentle summer waves and a soft sandy beach - perfect for families. Learn to surf just steps from your door or sit and gaze at the beauty from the deck. You cant ask be a better location. The house itself is well kept and well positioned to capture the beach breezes. The owners are very responsive if anything should happen to go wrong and want your experience to be perfect. You can walk to town or jump in the car for world-class snorkeling at Tunnels and Kee beaches, just minutes down the road. Unbeatable location, some things lacking This place has an unbeatable location. The views at the house are incredible (beach in front, mountains at your back) and having one of the best beaches right in front is an amazing experience. It was extremely relaxing getting to fall asleep to the waves crashing on the beach. We were greeted with a welcome basket as well, which was a nice touch. The house was clean and the photos represent the house fairly well. My husband and I came for our honeymoon and it is the perfect place for this type of trip. The location, despite being in the northern section if the island, is still relatively convenient to everywhere (within one to a little over two hours. Note that traffic north of the airport can be bad at certain times of day. There is enough to see and do close to the cottage that you dont necessarily need to travel far to do great activities. Not that it really impacted our stay, but there were a few negatives I wanted to mention since all other reviews were extremely positive. I cant rate the place higher since the house was not well stocked for us. No extra rolls of toilet paper, paper towels, barely any cleaner in kitchen for wiping counters, minimal laundry detergent to name a few was disappointing given the cost and what I would have expected for an extended stay (and amenities described with the house). It almost felt like the owner was banking on the visitors resupplying the house during their stay, which as I mentioned before was not gratifying. Other cons are no air conditioning (it got hot during daytime hours) and no dishwasher (which I think is a must to ensure dishes are fully clean/sanitized between visitors). The house is also right next to a couple other homes, so it is not as private as you might expect from the photos, especially since windows have to be open all the time. We had a great visit and I wouldnt say these things are enough for me to not recommend this place, but wanted to bring them up so others can compare this more accurately to other rentals. Owner response: I checked with our cleaner and she says there is a glass cleaner, a de-greaser, and a bleach type product under the kitchen sink. There are cleaning towels stocked with the extra towels & sheets and labeled as rags. We will make sure there is an extra roll of paper towels under the sink (which these folks may not have gotten), there are generally 2-3 rolls of T.P. under the sink as well as what is on the roll for a stay of a week or less. Charcoal, lighter fluid, and kitchen condiments & various kitchen convenience items are usually replenished by the guests. We have a starter amount of laundry soap or sometimes a lot depending on the previous guests. So sad... there is no dish washer nor will there be. There will not be air conditioning either. There was a recent hot spell without much breeze which these folk may have experienced though it was still lovely at the beach in the shade of the trees and in the water. Usually ceiling fans make the rooms comfortable and there is an opening sky light which allows air to escape from the highest part of the ceiling. Amazing Location, Super Cozy Cottage My husband and I stayed at the Hanalei Moon Beach Cottage over Thanksgiving, and we couldnt have asked for a better location. The cottage is the perfect size for two people, and the living room has an amazing view of the ocean. It literally takes about 30 seconds to get to the beach - just walk across the grass, and youre there! The cottage itself is not terribly modern, but everything is clean and works well; we had no complaints about anything. Hanaleis shops and restaurants are about a mile away - it wouldve been nice to be a little bit closer, but the walk is only 15-20 minutes, and given the choice of being closer to the town or the beach, Id rather have the beach. Overall, we had a great stay, and wed like to return to the cottage in the future. Awesome location This was a perfect little beach house. The view is straight out to the ocean. Its walking distance to town where there are several restaurants but we found the fish market and ate in instead since the restaurants didnt have as good a view as the cottage. Perfect base for our vacation The house was a perfect base for our vacation. It was exactly as pictured and, while not fancy, was everything we needed. The location was ideal; we had picnic breakfast on the bay each morning and it was a short walk into town for shopping and our one dinner out. My husband and I enjoyed the barbeque the other evenings. The only drawback was the closeness to the highway, but, honestly, after a day, we were not overly disturbed by road noise. If you a looking for a neat and tidy, affordable house in Paradise, with an easy-to-deal-with, professional landlord, Aunty Lydias Ohana is for you and your family. Loved staying here Lee Pierce1 (-) Date of Stay: 06/15/09 Review Submitted: 06/15/09 We loved staying at this very cute home. It was clean and comfortable. After driving most of the island, the north shore is by far the prettiest place to stay. We will go back for sure. There is so much to see and do, one trip was not enough. When we return this house will be our home away from home on Kauai. Nice Place, Great Location We used this as base camp for our various North Shore adventures. Clean, comfortable, simple, well maintained, straight forward...had everything we needed. Everything about the property was as advertised and worked as advertised. Outdoor shower was my favorite. Would be good for families. Close, easy walk to beach and town. The rental agency people are cool and very easy to deal with. Bottom line if you are looking for a 5-star resort this is not it. But if you want a chill little house in a great location, it is great value for your money! I had a really nice stay in Hanalei! The house was very cozy and clean. The neighbors were very nice and loaned us their Paddle Board. The area was very quiet after 10am. The walk to the beach was very short and the beach was, of course, amazing. We would recommend the Ohana for families or couples anytime. The sleeping arrangements were perfect for us with 2 large beds in separate rooms and a third room with twin beds. We did a lot of cooking and barbecued some fish and steaks. Dont bother buying charcoal, like I did, as the grill is propane. "Easy walk to the beach and to town what more do you want?" Great place to stay with family and friends. Clean, spacious, and great location made us want to return to kauai for another vacation. I probably would recommend this accommodation to my best friend! Nice well priced rental house We were looking for an affordable rental in town and were very happy with our choice. We only needed 2 bedrooms but this was less expensive that the two bedroom places on VRBO so we had more than ample space. The house isnt "fancy" but was very comfortable and had everything we needed plus a nice yard for our daughter and her friends to run around. The location was fantastic (two blocks to Grandpas beach). We definitely made use of the bbq, boogie boards, snorkel gear and beach toys that are available. We also really enjoyed the history of the family who lived there. Thanks so much and we hope to be back soon! BTW, very cute womens boutique up the road in Kilauea called Oskars. The owner, Anne, was really helpful and has fantastic clothes! home with character The location of this home was great, centrally located in the middle of Hanalei Bay, very close to the beach. We had everything we needed and felt very comfortable. The house has so much charm, plenty of space, wonderful views of waterfalls and mountains; we would definitely stay here again. Comfy and cozy The house was comfortable and cozy for the four of us, including two teenagers. Its proximity to the beach and the town were great, the view of the mountains fabulous. Everyone was friendly and helpful, and it made us absolutely LOVE Hanalei. Wed stay there again in a heartbeat! The property was very clean and well maintained. A short walk to a very nice beach. The town of Hanalei is just down the road with a grocery store, restaurants and shopping. Planning on coming back soon!